- High Source of Flavonoid Antioxidants. - Provides Beneficial Essential Oils That Fight Cancer. 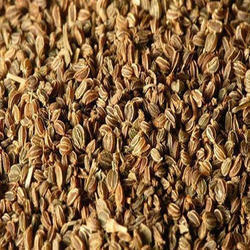 We are successfully meeting the varied requirements of our clients by providing the best quality range of Ajwain Seed. Celery has been used since earliest times as a food, for flavoring and for medicinal purposes. Of uncertain origin, perhaps the Mediterranean region, the bitter marsh plant grew wild on wet and flooded salt marshes, and it is sometimes called "smallage, " a biennial with stalks that grow from one to two feet. Celery is a plant variety in the family Apiaceae, commonly used as a vegetable. The plant grows to 1 m (3.3 ft) tall. The leaves are pinnate to bipinnate with rhombic leaflets 3–6 cm long and 2–4 cm broad. 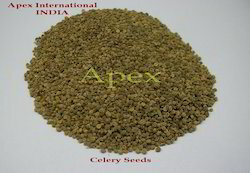 Celery seed is used mainly as a spice in India. We offer finest quality of celery seed..
Has been known in the Mediterranean since millennia. Homer’s mentions them in his epics it was con sidered a sacred plant in the classical period of Greece. It is less known, though, that celery leaves were worn by the winners of the nemean games, similar to the use of at the Olympic and the python games. Celery seeds are the dried fruit of apium graviolens, which belongs to the parsley family. The seeds are very small, oval-shaped and light green in color. They have a crisp texture subtle flavour. We bring forth vast industrial experience and expertise in this business, instrumental in providing Celery Seeds.